All men, from every stage of life, are invited to join the Men’s Ministry! Come learn, share, and grow in your faith through prayer, talks and fellowship! 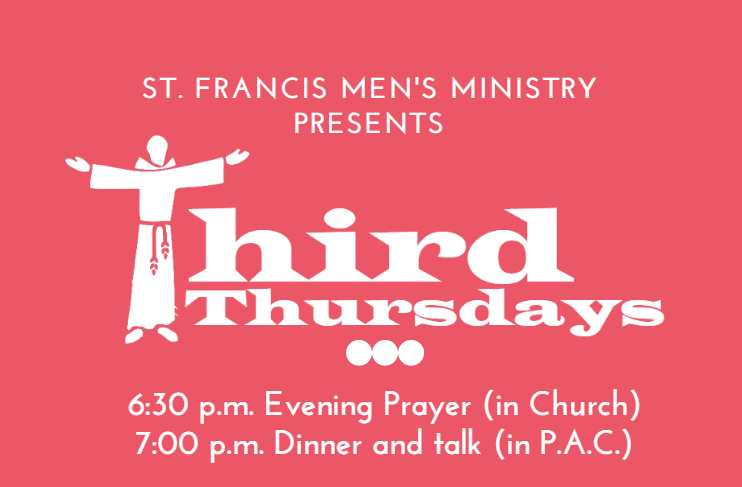 The St. Francis Men’s Ministry exists to join men more fully each day to live as disciples of Jesus Christ through prayer, brotherly support and sharing. $10 suggested donation for dinner. See you at Holy Thursday Mass, as we celebrate Jesus’ initiation of the Eucharist. Marty Bodnar, devout Catholic, attorney, and former U of M Basketball player, will share with us his personal testimony of faith. He will speak on how his faith in Jesus Christ has motivated his work as an attorney and passion for collegiate athletics. This will be a parish-wide, family-friendly event! Join us in the celebration of this special feast!